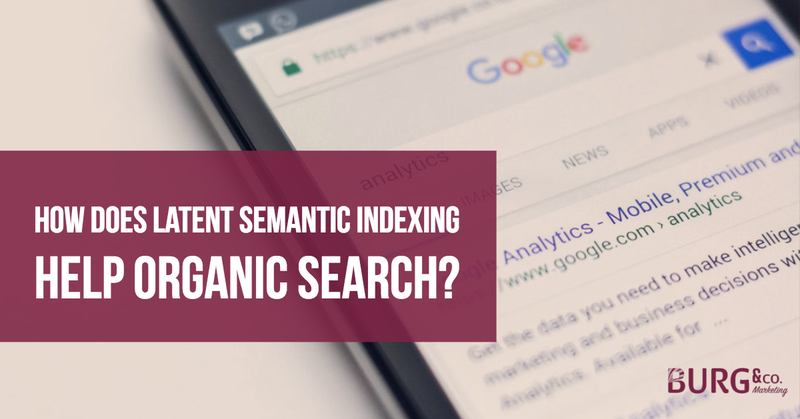 How Does Latent Semantic Indexing Help Organic Search? Latent Semantic Indexing (LSI) is a method of identifying patterns in relationships between terms within certain contexts. LSI is frequently confused with synonyms, but it’s actually quite different. Instead, Latent Semantic Indexing compiles data to identify how two otherwise unrelated words or terms would work together in certain contexts. For example, car and seat are two words that have their own meanings, but when used together, they refer to a specific type of child’s seat for use in vehicles. LSI teaches search engines and machines how to understand these types of speech. Some marketers maintain the theory that using synonyms in your content related to your keywords throughout your text will boost your page’s visibility due to LSI’s understanding of language. However, Google has made no statements regarding this nor is there any verifiable data demonstrating the effectiveness of this strategy. As far as research shows, it’s not harmful to include synonyms in your content related to your keywords. In fact, if the synonyms are helpful in the context of your content, then they will be good for user experience. However, relying on the use of multiple synonyms as keywords when they are unnecessary may add confusion to your content and downgrade your page’s user experience. Instead of focusing on the use of many synonyms or related words, you should focus on creating excellent content and user experience. These are the organic factors that help make your page stand out above others. Quality content – Writing content that engages your target audience’s needs, is informative and relevant to the keyword phrase that led your audience to your page is key to improving your web presence. On-page SEO – Make user-friendly URLs and page titles using your keyword phrase if it fits organically. You should also write informative meta-description content using your keyword phrase. Google does not weigh meta-descriptions as part of SEO ranking because they will autofill these descriptions. However, adding your own customized description is better for the user and may result in increased traffic. Image alt-tags – Add brief and descriptive image alt-tags. This is another area where you can make use of your keywords to add additional weight to your page’s ranking. Mobile optimization – Make sure your page is mobile-friendly. Many web platforms now automatically adjust pages for mobile view, but some factors like large image or media file sizes and clutter content can make mobile loading times slow and user experience unpleasant. Additionally, pages with mobile optimization are more likely to rank higher in search results than those that are not mobile-friendly. Our team of digital marketing experts has years of experience in developing strategies for SEO, PPC campaigns, social media marketing and more. Contact us today to discover how you can increase your traffic and revenue with a well-rounded digital marketing strategy.